So you're getting ready to buy a kayak for fishing and you don't know what to get or what features are important. Well, I don't profess to know everything about the subject, but I recently went to the Austin Canoe & Kayak Demo Days in Austin and got to ride on some of the best kayaks out there. I'll see if I can accurately recount my experiences here. For those of you who do not know, Austin Canoe and Kayak put on an awesome event every year about this time. They have several events associated with each of their locations. This one was located in northwest Austin near Mopac. 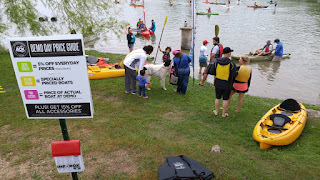 And I must give this disclaimer: No matter what I say about kayaks here, the single best thing you can do before making a decision about a kayak is to go to one of these events and try as many kayaks as you can. Of course, I recommend doing some research ahead of time so you know which ones not to bother with and which ones really sound right for you. 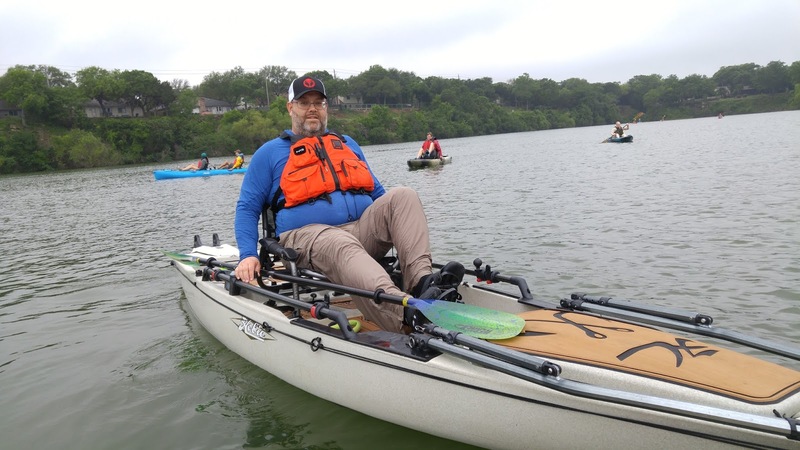 Many months ago we had decided that if we ever had a chance, we would make every effort find a way to take a ride in some of the kayaks we had been noticing at kayak tournaments. Some of the most popular kayaks were the pedal style kayaks. While we weren't sure about these since we like to river fish, these were definitely on the list. But most important for us river fishers, we wanted to try out the Feelfree Lure 11.5 and 13.5. The FeelFree kayaks have always been appealing to us. Both Sarah and I noticed right away by looking at them that they would likely be more stable than what we currently have. But we wanted to try them out for ourselves and make sure. As I said before, we spend a lot of time on rivers - specifically the Llano river. This river is known for being shallow in many places requiring the need to portage frequently. Even if you aren't portaging, you'll find that banging into rocks is a way of life on most Texas rivers. Having a kayak that is light enough to drag down a river and yet wide enough to be stable is a pretty difficult to find. But after riding the Feelfree 13.5 we felt more confident than ever that it would work for us. Sarah of course gravitated to the Lure 11.5 which was better suited to her, but had the same exact features as the 13.5. Other than stability, the most important thing about the Feelfree is it has a phenomenal seat. The seat is the type that you instantly feel like you could sit in it all day. It's much more comfortable than any flat style seat and it's arguably better than most of the other bench style seats. It has the ability to raise and lower with very little effort, though not as easy as the Hobie. The adjustment for pedal distance was actually in the pedals, but was easy to reach from the seat using a unique pull handle system. Overall the seat on the FF is awesome! As mentioned before, the stability on the Feelfree was very good. It felt to me that the stability was great enhanced over the Jackson Big Tuna, but this may be somewhat jaded because the Big Tuna doesn't have a clear deck, plus it doesn't have a seat that allows you to stand up easily. On the big tuna my behind is 1 inch off the bottom, where in the FF with the seat in the upper position I'm a good 10 inches off the bottom. This makes a huge difference in how easy it is to stand up and how easy it is to sit down. So standing up is a breeze, but once you're up, there's nothing on the deck to get in your way. As you can see from the pic, someone with a good balance could easily stand in the middle of the deck to move around. To put it simply, the Feelfree gave me one of the best rides I've had in a standard kayak except for one thing: Maneuverability. It was not terrible, but I would have to say, my Jackson Big Tuna could turn on a dime compared to the Lure 13.5 and my Big Tuna is over 14 feet. Both Sarah and I did some test runs and we could barely get the kayaks to move at a decent rate. This is one thing I respect about the Big Tuna: It can move at a pretty good clip. I've had that kayak moving at a pretty high rate of speed for such a monster. Sarah did better in the 11.5 but still noticed a difference over her own kayak. That all said, if speed is not your aim, then this kayak will be perfectly fine. In the end, I think the Feelfree Lure is a pretty good rig. The stability is better than the Big Tuna, but they get it by sacrificing speed and agility. 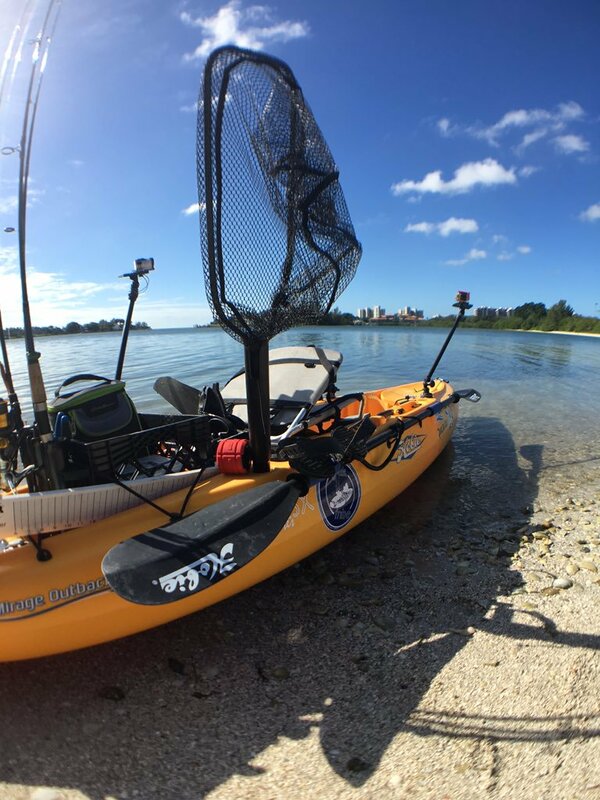 If you like to stand and fish, you'll love this kayak. For that matter, if you like to sit but aren't trying to win a race, you'll still love this kayak. It just feels good sitting in something that doesn't wobble every move you make. 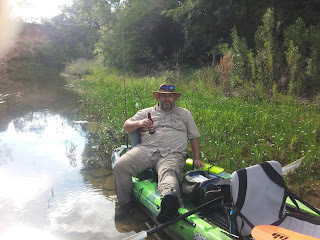 Since our goal was to try the paddle craft type kayaks we headed over the the Native Watercraft and tried out the Slayer Propel 13. First thing, the seat is fairly comfortable and is at least tolerable. It's about as comfortable as the Jackson Elite seats on my current kayak. The seat is on a roller system that allows extremely fine adjustment of where the seat should be for you. This is important because you may need to finely tune to distance based on your seat-to-pedal length. The height of the seat above your feet is pretty decent. However, this kayak has the same problem (if not worse) that the Big Tuna has because there is a console in the middle. This console is where the pedals retract or drop down so there's no changing how much room you have. Still in spite of these shortcomings, the Slayer was pretty stable. I'd put it at about the same as a Big Tuna. The thing that made it win over the Big Tuna for me is the height of the seat. It was just barely high enough for me to get my legs under me and stand up. More athletic folks will have no trouble with this. However, again, there is much room for mistakes since your feet really don't have much room. 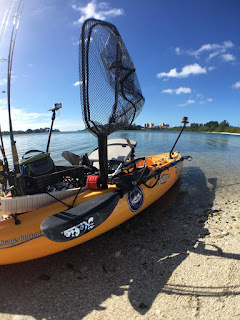 Maneuverability is much better in this kayak than the Big Tuna and it tracks pretty well. Over all this was the quickest kayak that we tested this day. It was easy to see why, in the tournaments, that kayakers could take off so fast and maintain a good speed so easy. It literally created a wake as it tore across the lake. And be careful turning that rudder all the way over - you better be ready for the turn because it turned on a dime. Better than the Big Tuna - even when using paddles. The Slayer turned so fast I almost dumped myself out of the boat a couple times. And I can't talk about the Slayer Propel without talking about one more thing regarding the propel drive. It can be pedaled in reverse. To be sure, it's not as fast as going forward, but I can assure you that if you paddle big lakes in the wind regularly, you'll love the fact that you can point yourself into the wind and then paddle forward or backward depending on what you need. There is one thing I seriously didn't like about this kayak. It seemed to gather a tremendous amount of water at your feet while underway. With your feet on the pedals this wouldn't be a problem, but any time you put your feet down and paddled, you'd be getting wet feet. This might not seem like a problem in July, but we do a lot of winter kayaking so wet feet is completely unacceptable. I've only ever seen the Jackson Big Tuna have water coming up through the scupper holes under extreme circumstances. I will say this - the floor where the pedals are seems to be lower than the rest of the kayak. This is likely because you need room to pedal with boots on or for those who have really big feet. I did speak to one person who said they put scupper plugs in those lower holes so the water wouldn't come up there. The Native Watercraft Slayer Propel 13 is a very decent boat. It would be an awesome tournament kayak due to it's speed and it's ability to hold a position in the wind without a time wasting anchor. No paddles required while you're casting and moving at exactly the right speed. If I was planning on being a major tournament player, this is the kayak I would get. it. Of course, the total capacity of 600 lbs is not surprising. The first thing I noticed when I got into.. or should I say ON... the PA 14 was it's stability. It is by far the most stable kayak I've ever been in. I could practically stand on one foot on one side of the boat. Well, that might be stretching it, but I can definitely see standing on 2 feet on one side of the boat. It just didn't tip that much when moving your feet around. This was the ONLY boat I stood in comfortably while paddling around standing up. After paddling standing up for only 30 seconds, I was standing straight and had stopped paying attention to what the boat was doing and enjoying the scenery. This is true stability. That said, there is a huge cost for this. This boat doesn't turn. Well, it does, but don't expect to turn on a dime, or a quarter, or maybe even a dollar. This boat is a yacht. It will turn when it feels like it. You may have to paddle twice to get it to turn. Maybe even 3 times to get it to complete a turn. This is verses once for the Slayer and maybe 1.5 strokes for the Lure. Seriously, this is likely one of the main reasons I would never take this on a river. However, if I was lake fishing, I would seriously consider this craft. if you are used to bicycling this method of pedaling will drive you nuts. It's not pedaling - it's pushing. It's a very comfortable method of pushing though and not hard to get used to. But probably the most disconcerting thing about is that feeling when you are pedaling along and suddenly need to stop. There's mad grab for the paddle - yep, better keep it handy! - and then getting into position to stop your forward motion. I could never put up with this on a river for this reason as well. However, proper planning and learning the motion would be fine on a lake. The PA 14 is a fantastic boat though. It has an incredible seat that lets you adjust up and down *while you are sitting on it*. This is the only seat I've seen that has this. Even the Lure you have to your weight off the seat briefly to adjust the height. Not so on the Hobie. Just pop the handle to the next position. Very nice feature. It also has lumbar support. Did I mention you can get a built-in massage too? No I didn't and it doesn't have that. But it should. It has everything else! All the pieces on the PA 14 fit perfectly. This boat has an excellent equipment layout with handles and gadgets that anyone can appreciate. The Hobie Mirage Pro Angler 14 is truly a fantastic boat. It may feel like it's more in a class akin to a bass boat, but for that fisherman that needs a stable, wide, and comfortable kayak, this is your boat. Don't look anywhere else. Just remember, this is NOT a river boat. Ryan Herzog (one of the Hobie reps), said that he knows someone who uses the PA 12 on rivers. This would make more sense, but I'd still be somewhat skeptical if it's as agile as the Lure series. - The Lure series was stable, yet agile enough to handle rivers. - The Slayer Propel was very agile, but felt somewhat like sitting in the cockpit of a plane. - The Pro Angler 14 was wide, luxurious, and phenomenally stable. But a slow turner. Each of these boats has it's place. - For the person who wants to race, get yourself a Slayer Propel. If you could master paddling and pedaling you'd fly like a rocket. - For the river fisherman, better stick with the Lure. There's nothing hanging down to get caught on a rock and it's a pretty light kayak at a mere 95 lbs compared to the 120 lbs for the Hobie. - For the lake angler, you'll love the Hobie. But be prepared to need a boat trailer if you're not a body builder. At the very least you'll need the wheels that you can have mounted to help you get it out of the water. You'll need all the help you can get. How do I feel about the Jackson Big Tuna now? You'd think I'd be extremely eager to get a Feelfree Lure 13.5 but I'm not so sure now. It's a nice kayak and has some features I most certainly like over the Big Tuna. But I haven't had a chance to even sit in a Coosa and the HD model looks like a pretty good fit for me. If I had the money I could even see springing for a Coosa HD Pro. Over all any of the kayaks above would make great kayaks for the the pro angler. But for my purposes, I need a fairly agile kayak that I can still stand up in, yet will provide all the amenities needed to do some pro angling. Jackson Kayak has several kayaks that fit these needs very closely. The fact that I've never seen one at a tournament could simply mean poor market presence in Central Texas. And that's the problem. There are very few dealers in central Texas now. I'll have to drive 80 miles to go find one! If someone from Jackson reads this - you guys need a Jackson dealer closer to the upper hill country! I've heard that Austin Canoe & Kayak may start carrying Jackson's. If so, this will be a big deal for those of us who like the Jackson brand. Again, the single most important thing before you go buy a kayak is to GO RIDE IN ONE. I personally will not be buying anything until I can compare the ones I've ridden to the Coosa HD. If you've read this far, then you've done more than most will. Thanks for reading and hopefully this has been a help to you! Please let me know your thoughts. I would like to hear any suggestions that might be useful in helping me in my own decision - not to mention any comments may be useful to others as well. Thanks, and happy kayak hunting! Thanks! Looking for any criticism as well... any thoughts on the kayaks mentioned? I am very surprised about your Slayer comment and it turning on a dime. A common complaint on all the forums is the poor turning, also why there is at least 3 major aftermarket rudder conversions. Maybe you are referring to turning while at top speed, but try turning at a slow speed. I don't own one, but have been in one many times and trying to turn around or maneuver in tight quarters is the worst. Seriously though, that bothers me because the Lure 13.5 was hard to turn compared to my Jackson. I did some high speed runs and the tried to jab my paddle down and do a hard right and it seemed to take forever on the Lure. This would not be good on a river since that would make it hard to navigate rapids.